About 1 out of every 5 deaths in the US can be attributed to tobacco products. American Legacy Foundation is an organisation set up to ensure that young people don’t become part of those statistics. Two advertising agencies, Arnold Worldwide and Crispin Porter + Bogusky, teamed up to develop the television advertising campaign behind ALF’s Truth movement, using actual findings from big tobacco company documents. 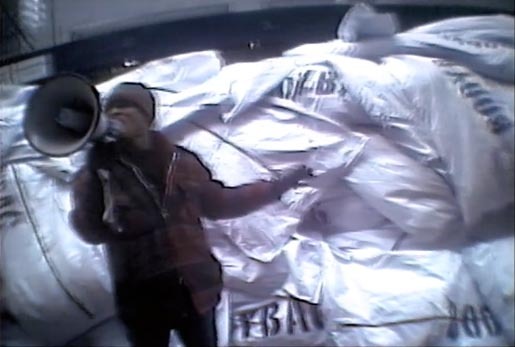 “Body Bag” was developed at Arnold Worldwide, Boston, by creative director Pete Favat, copywriter Ari Merkin, agency producer Keith Dezen, account supervisor Lisa Unsworth working with Truth marketing director Beverly Kastens. Filming was shot by director Christian Hoagland via Redtree Productions with director of photography Marc Bloomgarden and producer R.J. Casey. “The Voice” is set outside a major tobacco company protesters run around setting up two podiums and microphones. Bystanders watch, unsure of what is happening. On one podium is posted a placard with the letter “Q”. On the other is the letter “A”. 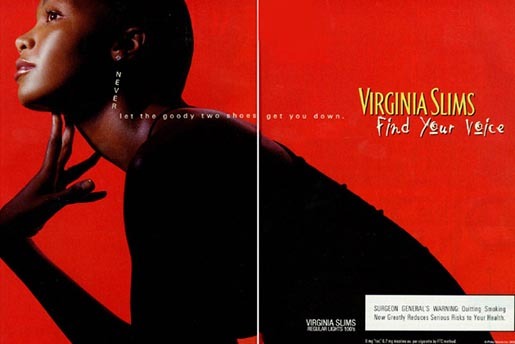 A large advertising poster is unravelled, featuring Virginia Slims, with the line, “Find Your Voice”. At the Q stand a woman addresses the street. “Tobacco companies have been targetting women for the past seventy years, asking us to find our own voice. Today my friend Grace has a question for you guys.” Grace comes to the microphone and speaks through her artificial larynx, “Is this the voice you expected me to find?” The camera moves to the A stand. Noone is there to answer the protesters. Silence. The text comes up, “Ask Questions. Seek Truth”. The USA company behind the brand, Virginia Slims, is Philip Morris. The Voice ad was developed at Arnold Worldwide, Boston, and Crispin Porter & Bogusky, Miami, by creative directors Ron Lawner, Pete Favat, Alex Bogusky, John Kearse, Tom Adams, copywriter Jackie Hathiramani, art director Tricia Ting, agency producer Carron Pedonti. Filming was shot by director Christian Hoagland via Red Tree Productions, Boston, with producer Jeff Trenner. Editor was Tom Scherma. The Truth ad won a Silver Lion at Cannes 2005. 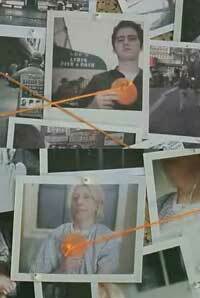 A group of anti-smoking activists take photographs of people on the street, posing with orange circles. “Did you know that 1200 people a day die from tobacco related illnesses”. “My grandfather died April last year.” “Can we take your picture for a survey?” “Do you know anyone who’s been affected by a tobacco related illness?” “Yeah my uncle and my godmother. They smoke a lot.” “My name is Lucy Abbott. I’m waiting for a lung transplant. If you didn’t know someone before, you do now.” Connect truth. The Creative team from Arnold Worldwide and Crispin Porter + Bogusky included Creative Directors: Alex Bogusky, Pete Favat, John Kearse, Tom Adams, Ron Lawner Copywriters: John Kearse, Marc Einhorn, Jackie Hathiramani, and Art Directors Phil Covitz, Brandon Sides, Tricia Ting, and Meghan Siegal. The films were directed by Christian Hoagland and produced by Carron Pedonti from Redtree Productions, with photography directed by Hans Gissinger. The ads were edited by Tom Scherma from Cosmo Street.